For my project today, I made a bat spinner card for my little nephews! It's a 5" x 6 1/2" card (I love how my We R Memory Keepers Envelope Punch Board frees me up to make any size card, knowing that I can still make a matching envelope). That cute patterned paper is from the My Mind's Eye Wicked collection, which I found at Michael's. It was perfect for the scene I wanted to create. I tried to get some pictures to show you the movement of the bat! 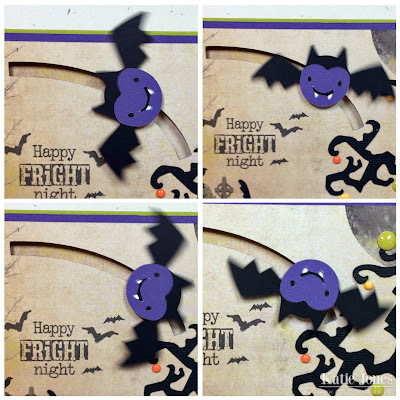 If you've never made a spinner card before, my friend Liz, of Liz's Paper Loft Boutique, has a great tutorial. I wanted my bat to spin down in a semicircular direction, so I created the slot in Silhouette Studio. The cute bat was made with the Cricut Create a Critter 2 cartridge, cut at 1 1/4". 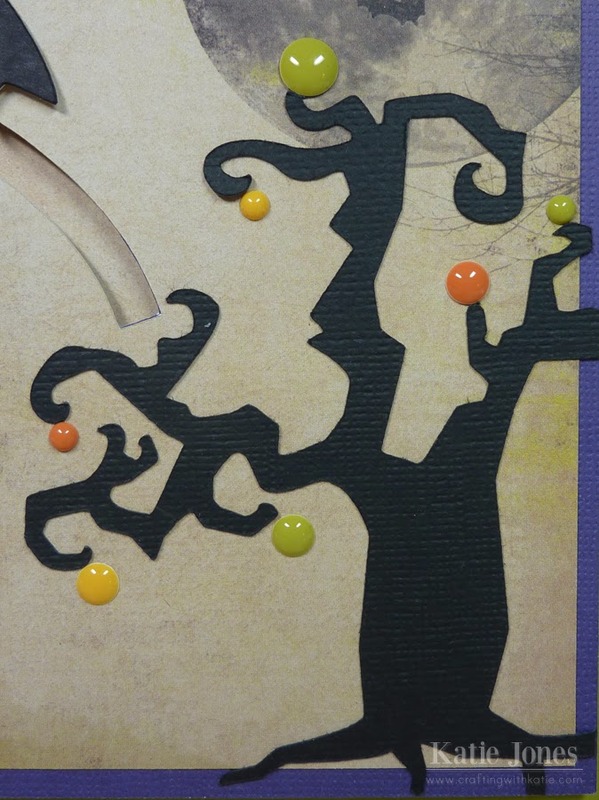 I used the Cricut Chic & Scary cartridge to make this spooky tree, cutting it at 4 1/4". The enamel dots are also from the MME Wicked collection. This cat is also from Chic & Scary, cut at 1 1/2". 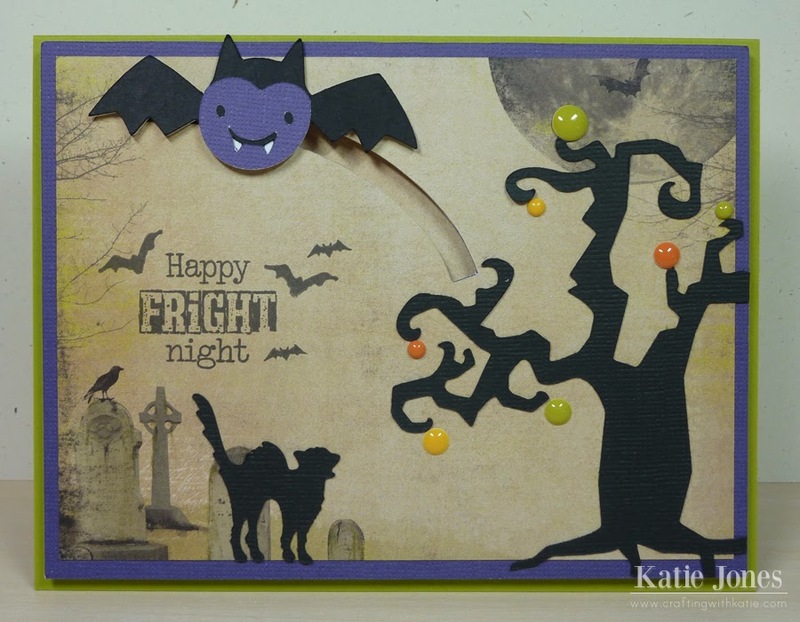 The spooky sentiment and the bats are from My Creative Time's Fright Night stamp set. I just love how well they match the paper! I love the spinner card. Awesome idea to make it a semicircle. Your card is wicked awesome and so clever. I love what you made with your Cricut and another thing I love is the perfect duo of Miss Emma's goodies and the Cricut. OMG how awesome is this Katie! Such a CLEVER idea and so super adorable!! bat is cute and fun! 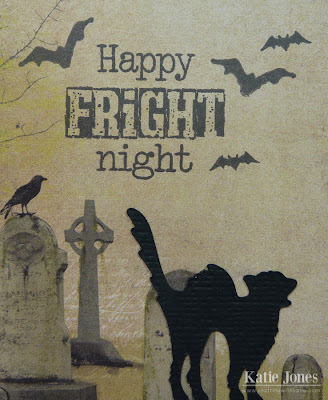 Spook-tacular card! LOVE the spinning bat! Super cute, love the enamel dots...they're my obsession!! That's a great card, I just love it! This is super adorable and I love that you made it into a spinner card! Awesome, spooky scene! This is wonderful. I bet they will love it. TFS. This card would be super fun for anyone! Now I have to watch the tutorial. Love the spooky tree and bat! I have not made a spinner card yet! Your little bat is so cute and great idea to have the Cameo cut the slot. I like the enamel dots and tree. Great card. Sorry wrote wrong comment. Great cuts and spooky scene. great fun card. The scene you created on your card is fabulous. Love the bat. Wow, so cute. I love Halloween. Katie ~ what a FUN and FABULOUS card your nephew will LOVE!!! I think all the details are AMAZING with the Perfect little elements added!! I have never made one of these before but now I want to try!!! Awesome job as always and thanks for linking to Liz's! !